I took this picture in May 2006. We spent a week in the Bay Area for S&H's wedding, and threw in some sightseeing while we were there. It is always fun to visit a place you know well, looking at it through tourist's eyes. 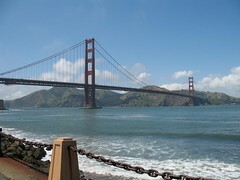 And an icon like the Golden Gate Bridge is especially photogenic on a sunny day.